Deciding on your kids bedroom decor can be quite a challenge -- the space should fit seamlessly within your overall home design, but it should feel uniquely youthful and sweet. With these five simple Dot & Bo-approved tips, you can create an ultra-modern yet playful kid's space in no time. Designing any interior is no small feat -- but it doesn't have to be a stressful affair. The team at Dot & Bo believes in starting each home design project with an overarching concept. This way, we don't end up with a bathroom styled in the mid-century aesthetic with a living room that skews heavily towards industrial design. Most of the time this strategy works very smoothly. We figure out what overall atmosphere we want to create in a home, then dive into details to bring the vision alive in each room. The one time this gets a bit complicated? When there is a kid's room involved. 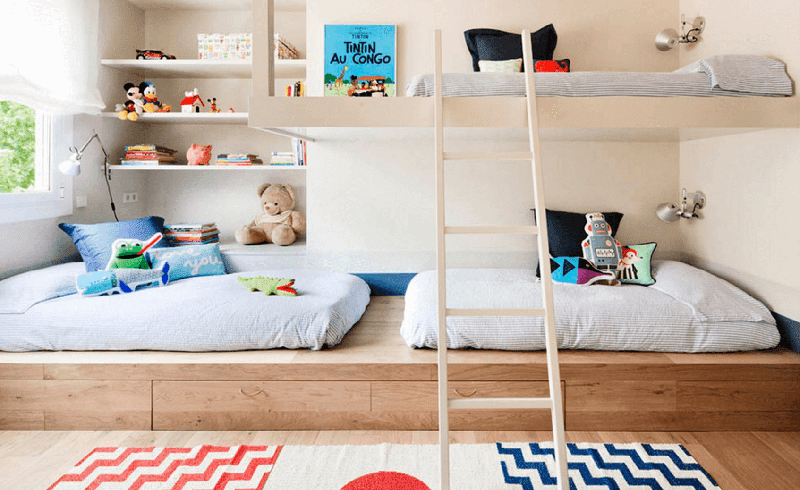 We want these rooms to fit into our overall design scheme, but at the same time they need to feel fun, whimsical, and childlike. So, how do we make sure that both goals are accomplished? As with any bedroom, the bed frame is the largest piece of furniture and is where our eyes are immediately drawn. Because of this, you have to make sure that your child's bed is modern by design with clean lines and preferably featuring a neutral color palette. Keeping this modern piece of furniture contemporary will allow you more freedom when it comes to the bedding. Even if your son wants bold patterned sheets or your daughter is set on bedding that features her favorite cartoon character, the overall look will be modern and sleek. The first thing to keep in mind when it comes kids bedroom decor is to maintain a minimal aesthetic. It's easy to get carried away with stuffed animals, little figurines, cutesy games and toys, but you should take a refined approach to avoid clutter. If you're lucky enough to have the space, create a separate playroom or designated storage space where most of these objects can be kept. As for the decor that you do display in your child's bedroom, try to mix sweeter, more youthful pieces with chic, contemporary designs. 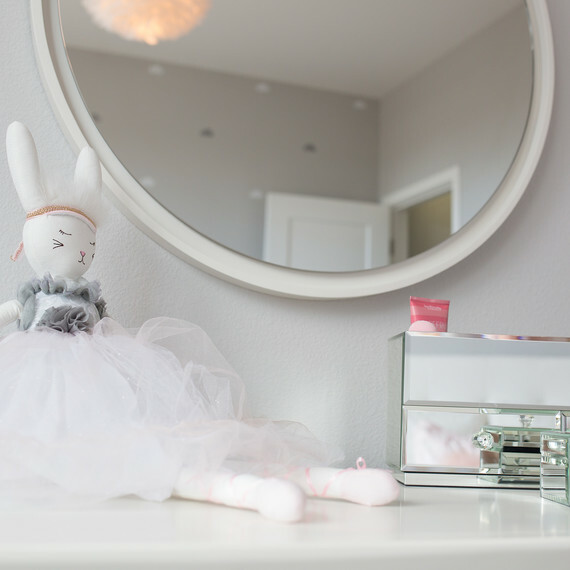 The mirrored containers on this dresser are ultra-modern, but work perfectly when paired with the bunny ballerina toy. Choosing more refined decor accents also increases the likelihood that your child will use these items for many years. Kids grow up fast, and their tastes change just as quickly! One of the best tricks for mixing two or more design styles is using reflective surfaces. They nearly disappear into their surroundings yet offer a sharp and modern edge to any room. Bonus: They are an even greater addition to any child's room because they help open the space and make it seem larger than it actually is. The great thing about light fixtures is that there are so many contemporary options that still bring in that element of fun. I love how the puffy pendant light featured in this little girl's room adds the perfect touch of whimsy while still maintaining its modern design. 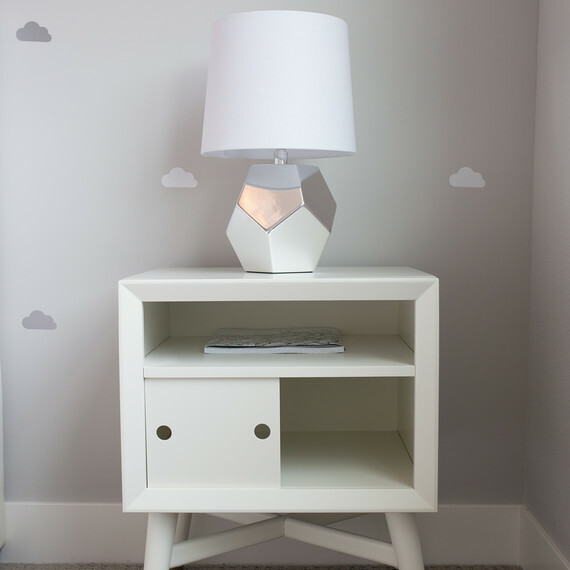 This table lamp is simple and sleek, but its angled edges and mirrored surfaces make it look magical -- perfect for any little girl who dreams of fairies and enchanted princesses. It can be easy to base the design of a children's room on one specific theme, like cars or dinosaurs, but here's a little secret: You don't need one specific theme to get the feeling you want across. This room uses subtle accents and a mixture of textures to create the its dreamy and ethereal atmosphere. With a simple gray and white clouds pattern on its bedside wall, it not only creates a focal point to the room, but conjures up the imagery of dreams. The space adds a dash of variety with soft and plush textures like fur pillows and fuzzy throws. A gray cloud accent pillow ties the theme together and keeps the room from feeling too pink, while the mirrored surfaces that we mentioned before give everything that contemporary touch. 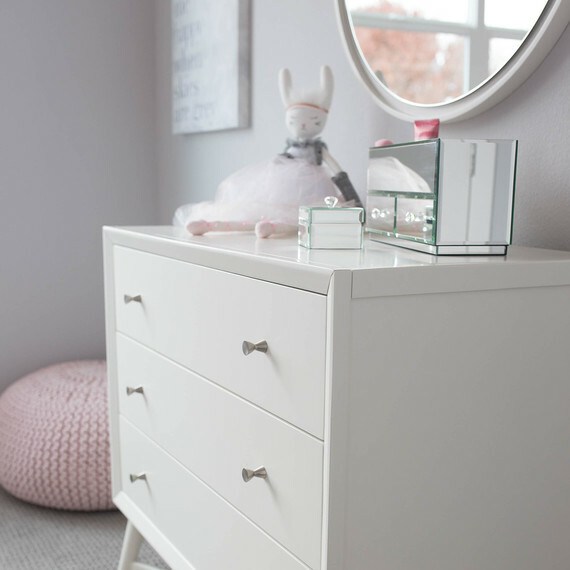 Including trends in design can be a great way to keep your kid's room feeling modern and fresh. For example, a sheepskin rug may seem like it won't work in your playful daughter's room, but when placed correctly across the top of a well made bed it looks fantastic! When designing your home, don't feel like you can't include your kids' rooms in your overall design concept. With a little planning, these bedrooms can fit in seamlessly with your home's overall aesthetic. Just make sure you're keeping silhouettes modern and combining whimsical imagery with contemporary designs.